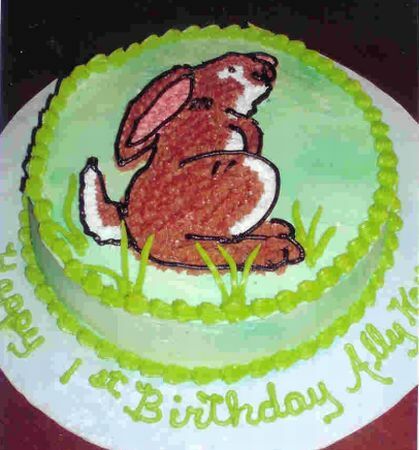 With an icing filled bag and round tip, size #5, draw the bunny on the cake top. Use a star tip, size #5 to do the outline work. With pink icing, fill in the inside of the bunny's ear and his nose. Use white icing and fill in the white areas of the bunny's body. Make a medium brown color icing and fill in the rest of the bunny's body. Use black icing and a round tip and outline the bunny. Do not forget to make a dot for his eye. Now, make a yellow-green color icing and use leaf tip, size #352 to make grass tufts around the bunny. To make the grass tufts, just pull up quickly as you squeeze the icing bag lightly. Now, change the tip to the star tip, size #18 and make a shell border around the top edge of the cake and the bottom edge of the sides of the cake. With the round tip and the same green icing, write the birthday message or Easter message on the cake board. This cake was actually made for a party themed around the children's book "Guess How Much I Love You", which was a very cute bunny themed party since the main characters in the story are bunnies!